Now it’s time to learn to use them. Many people in Pakistan look forward to investing in Bitcoins, but they don’t find any online guidance for getting started with it. 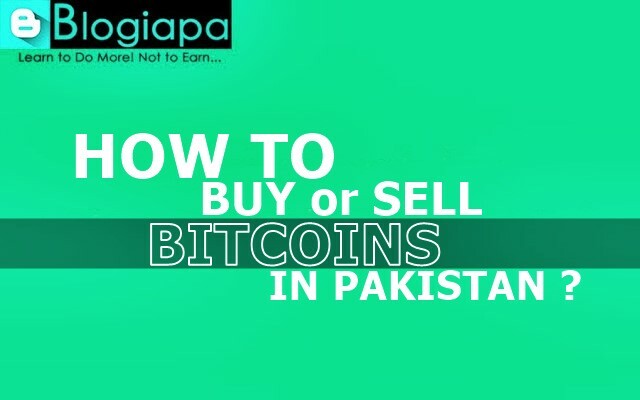 In order to cater this need, I am sharing detailed steps involved in buying and selling bitcoins in Pakistan easily and in a secure way. Salam Friends! Previously I posted, what is Bitcoin, Bitcoin Kya Hai in Urdu? Now it’s time to learn to use them. Many people in Pakistan look forward to investing in Bitcoins, but they don’t find any online guidance for getting started with it. In order to cater this need, I am sharing detailed steps involved in buying and selling bitcoins in Pakistan easily and in a secure way. The exchange we will use is LocalBitcoins. The reason for this choice is that a large number of Pakistani vendors are available there, thus we can do transactions in Rupees through our local banks. Another reason is that many payment options are available (eg. cash, online bank transaction, Western Union etc.) and transaction are processed very fast, usually within an hour. Let’s see how to get started with LocalBitcoins. 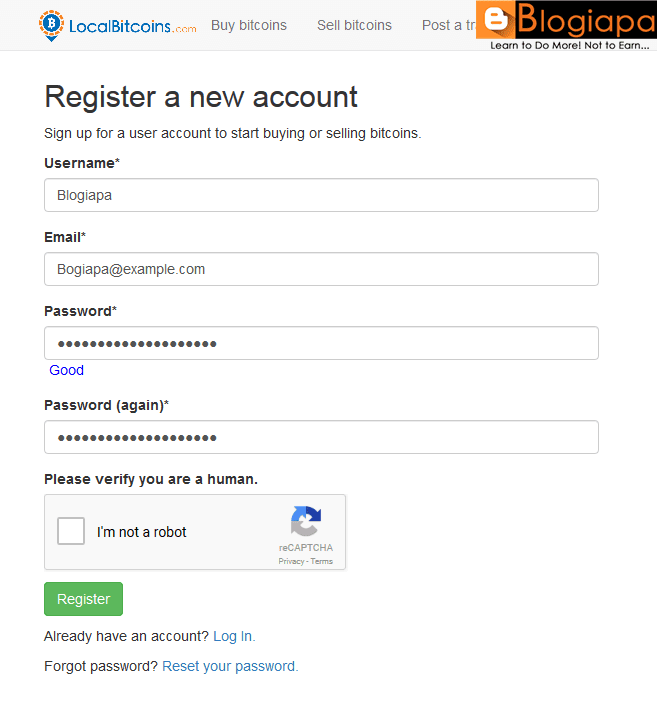 1 - Sign up at LocalBitcoins. 2 - After Signing up, Add your phone number and also make use of two-step verification for enhanced security. Prove your identity by uploading scanned CNIC or Passport. You can still Buy & Sell without proving your identity but some vendors may require it for large transactions. You are now registered and also have a bitcoin wallet. 3 - Go to the Buy bitcoins page and select Quick Buy. Enter the amount which you want to invest in buying bitcoins. Choose the transaction method. 4 - Upon searching you will see a list of traders offering to sell bitcoins. Choose the one with a good reputation and high response time. The first trader "abdulmanaf123 (3000+; 99%)" has done 3000+ trades and has 99% positive reputation. Choose the payment method (eg. Easypaisa). Also, beware of price per Bitcoin asked by the seller. 5 - After you select a trader you will see information about terms of trade. If you agree to terms then proceed by clicking on "Send trade request". Additional information about where to send the money will be generated. You will have a limited time, usually 90 minutes, to transfer money. Your bitcoins will be available in your wallet once the seller has verified the payment. 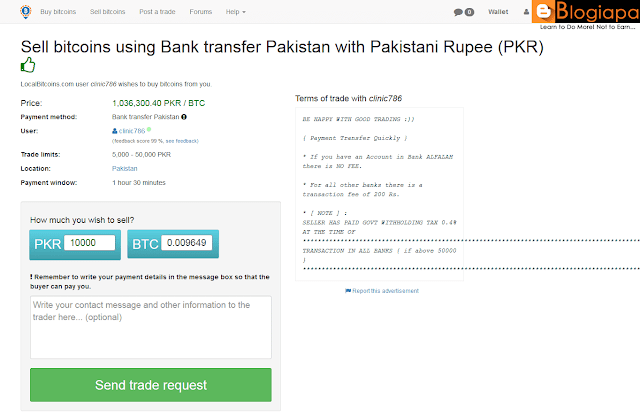 How to use bitcoins in Pakistan? 1 - To send bitcoins to someone just click on ‘Send bitcoins‘. Enter the address of the other person’s wallet where you want to send. Enter the amount and click Continue. Your Bitcoins will be sent to the address. 2 - To receive Bitcoin just generate the address of your wallet by clicking on "Receive bitcoins". Send it to the person who wants to send you bitcoins. 1 - Selling bitcoins isn’t much different than buying. 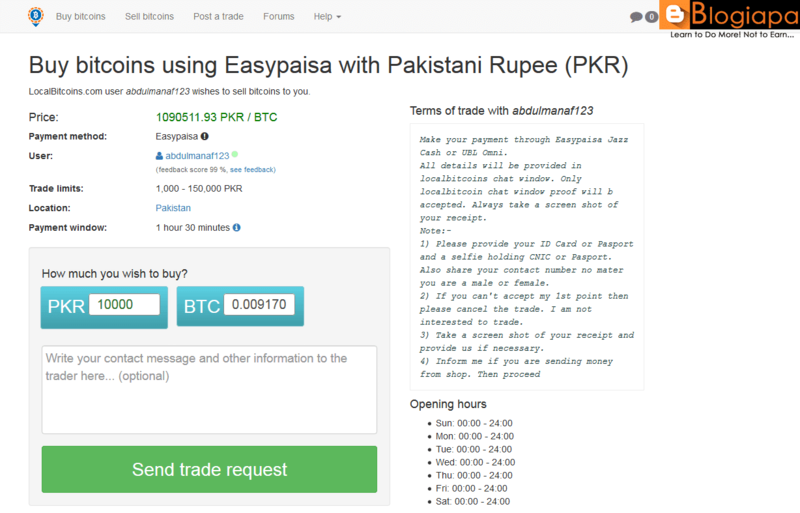 Just go to the main page and select ‘Quick Sell’ and enter the amount in rupees for which you want to sell bitcoins. Choose the payment method (eg. Easypaisa). 2 - Select a trader of your choice and press sell. You will see terms of trade and other information about the trader. Take into account the reputation and trade history of the trader before sending the request. 3 - Send the trade request. The buyer will contact you and ask for payment details (eg. your account number, in case you selected the bank transaction method). 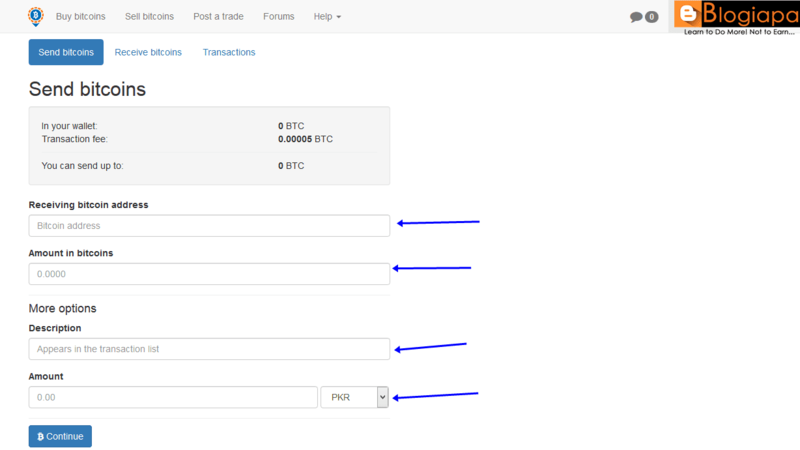 4 - Once you have received payment click on ‘Release bitcoins‘ to deliver them to the buyer. In case you accidentally released bitcoins before payment there is no going back. Transaction once made cannot be reversed. That’s all friends. LocalBitcoins is more like an online marketplace where buyers and sellers are connected with each other. The transaction fees are low and are applied only if other person’s wallet is outside LocalBitcoins. The best thing is that this service is available in Pakistan. If you have any questions feel free to leave your comment below. we always provide the best support for our readers. If you want to be awesome, you can join via my referral link. If you choose this method, let me know in the comments so I can thank you! And share this post with your awesome friends. Seriously. It helps a lot with the growth of this blog. Most of the readers don't share as they feel that us bloggers don't require their "tiny" social share. But here's the fact. I developed this blog piece by piece, your one small share at a time, and will continue encouraging me to do so. So I appreciate your support, my dear reader. Blogiapa - Learn To Do More! : How to buy or sell Bitcoins in Pakistan?